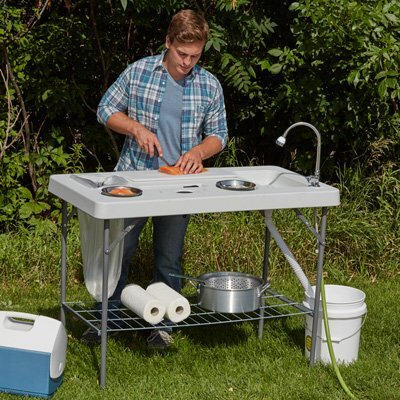 This deluxe flex fish cleaning camp table with flexible faucet and accessories is portable and easy to move and set up, so you can clean your catches without mess or hassle. Plus, it's great for tailgating or backyard parties. It features a flexible sprayer faucet that hooks up to a standard garden hose to provide fresh water and allows you to empty the sink into a bucket or floor drain to minimize cleanup. Legs lock in both the folded and upright positions. Accessories include 2 bowls, fillet knife, odor removing bar, cutting board, wire shelf and trash bag holder. Table is 50in.L x 25 1/2in.W x 37in.H when upright and 50in.L x 25 1/2in.W x 4in.H when folded. If you have any questions about this product by Kotula's, contact us by completing and submitting the form below. If you are looking for a specif part number, please include it with your message.